The Korea Food and Drug Administration (KFDA) requested Nong Shim Co. Ltd. to recall the six noodle brands immediately after the former learned of the news that benzopyrene was detected recently. But the KFDA conducted the test and issued a certificate dated November 7, 2012 that the level of benzopyrene found in the noodle powder, which ranges from 0.4 to 1.6 ppb, was extremely low and has no harmful effect on the human body. The Korean government has set limits in wet smoked fish products to 5 ppb, while dried smoked fish to 10 ppb. The European Union has similarly set the same standards for its wet smoked fish. Other countries, such as Japan and the United States, did not set specific standards for benzopyrene in smoked fish products, but recommended its industries to voluntarily reduce the presence of the said organic compound to the lowest possible level. 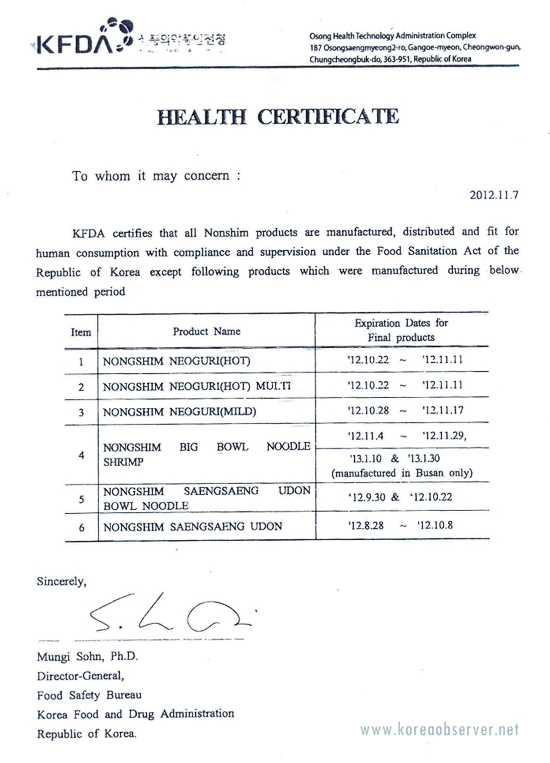 Based on the certificate issued by the KFDA, the Nong Shim Co. Ltd. is allowed to sell the six noodle brands that are now available in the Korean market without any complaints from the people. Furthermore, all foreign countries, with the exception of the Philippines and Thailand, have lifted the ban on the importation as the six noodle brands proved to be totally unharmful to the human body. Taipei authorities have also conducted its own test of the said noodle, concluding that the noodle is indeed not harmful to the consumers. The ban on the importation is seriously impacting the exporters and importers of the Philippines and Korea as well as the image of Korean-made noodles. Given this serious situation, the Korean Embassy requested the appropriate measures of the Philippine government including the expeditious lifting of the ban on the six Korean noodle brands.